I stupidly decided to measure my weight this week…. big mistake!! Now I know I shouldn’t let it worry me but I have so far put on 12 kgs from the beginning of my pregnancy. As you might know it is said that you should only put on 10 to 12 kg for he entire pregnancy. Since I still have 15 weeks to go this was very depressing. However I do have to realise that yes it is winter so regardless of being pregnant or not I generally put on weight at this time of year anyway. And yes I did weigh myself after just having had dinner for the night… so that wasn’t the smartest move. I have however decided to start doing some light exercise each day to try and maintain my fitness to help with not only maintaining my weight but being as healthy as I can for the birth and delivery of Addi. I believe I’m eating correctly and am not over eating but I do know that I have put some weight on my lower half which may be why I’m bigger than I should be at the moment. Especially since my doctor believes my tummy size is correct, and has not commented on my size at all. 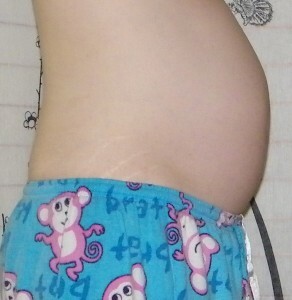 I’m measuring 94cms around the tummy at 25 weeks of pregnancy, here is my most recent baby belly photo. Remember for more information about eating right when pregnant and safe exercise to check out the My First Baby Pregnancy Guide articles!